So this past week I have been touring around south devon whilst staying at our family holiday home, on one of the days I decided to explore the town of Totnes. The small town is a hippie central with the long high street covering all different kinds of shops from well being to interiors. Although there were a lot of holiday makers about town there was also still the quirky residents which give the town it's hippy vibe. It was interesting to see the a huge variety in style and clothing around the town, from what it looked like many residents wore relaxed laid back clothing made from rich cottons and pure fabrics. Many items of clothing to me looked homemade which made me and my outfit choice stand out a little; I chose to wear dogtooth printed shorts with an embroided blouse, sport style sneakers and a long relaxed blazer. 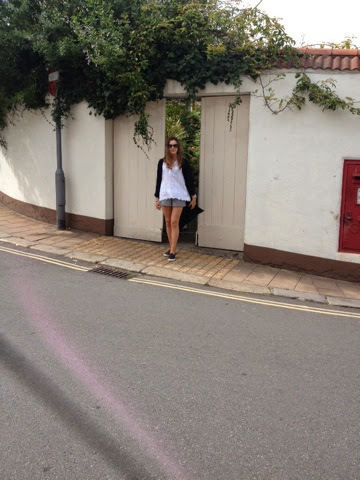 I would definitely travel back to Totnes in the future for the amount of homemade tea shops and individual boutiques. Outfit details: Shorts - Matalan, Blouse, Blazer & Shoes - Topshop, Sunglasses - Prada.